My mom and grandmother have been making this casserole for as long as I can remember. It’s a retro dish and very comforting. I’m not entirely sure where this recipe originally came from, but I think it might have been Toll House Tried and True Recipes. True to form, I made some of my own little changes to this recipe :-). **The original recipe calls for egg noodles and I fully encourage you to use them if you have them. Bring pot of water to a boil and cook pasta while you complete the next few steps. Season chicken with salt and pepper. Lightly brown in 2 tablespoons of olive oil over medium-high heat. When chicken is cooked through, remove from skillet and set aside. Reduce heat to medium. Using the same skillet, add enough olive oil to lightly the coat the pan. Add mushrooms, stirring and scraping bottom of the pan to incorporate all of the tasty bits. Cook for 4-5 minutes until mushrooms begin to brown. Add the garlic and cook for an additional 4-5 minutes until the mushrooms are tender. Add thyme, salt, and pepper and cook for one more minute to combine. Remove from heat and set aside. Over a double-boiler, melt the butter and slowly whisk in the flour, stirring constantly (no lumps!) for 3 minutes until combined and golden. Add the mustard and 1 teaspoon of salt. Slowly add the milk, continuously whisking to avoid lumps. Stir until thickened. 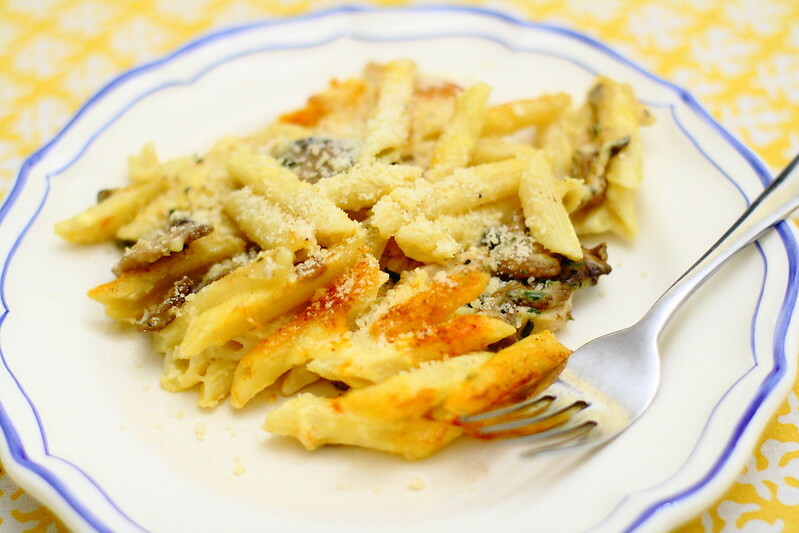 Slowly combine with melted cheese until sauce is thick and smooth. In a buttered baking dish, layer half the noodles, then the chicken and mushrooms, then the remaining noodles. Pour sauce over the mixture, and sprinkle with paprika. Brown in the oven and serve bubbling hot with grated parmesan cheese. Enjoy! 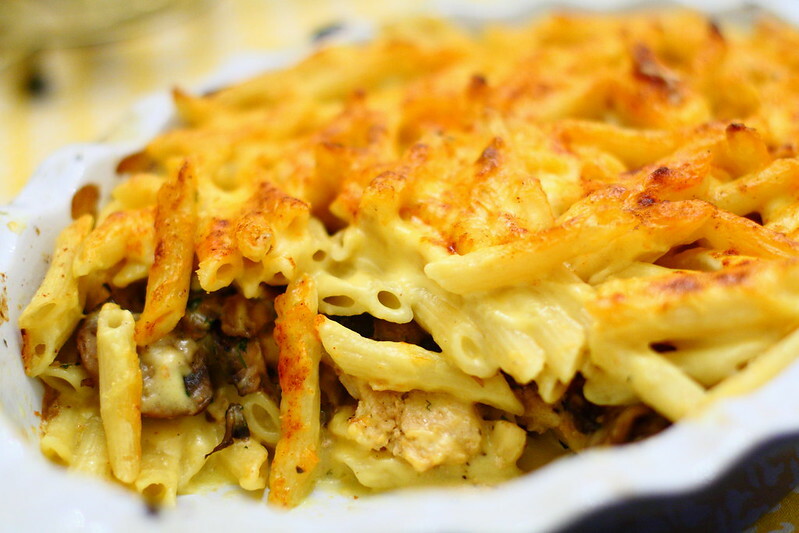 Creamy cheesy casseroles are my weakness, especially with pasta (mm, mm, carbs). Thanks for sharing this! this looks so delicious! I mean, is there a better combination than pasta and cheese? I think not. sounds like an amped up mac and cheese. yum! I can't wait to eat real food when I get out this hospital. That looks really delish. Look so delicious, thanks for sharing. You have the best recipe posts. That looks so delicious!!! Yum yum! Also, beautiful outfit in the last post, and your make-up also looks really cool.